CSN Stores has over 200 stores! They sell just about everything you can think of. They have Cookware, Luggage, Shoes, Gifts, Pet Supplies, Pub Sets, Beds, Bar Stools, Porch Swings, Strollers and so much more. They also have amazing Customer Service, but we will get to that in a moment. With over 200 stores to choose from, the big question becomes: what should I get? I spent hours looking at the CSN Stores websites and trying to decide on what to review. I first decided that I wanted something for the kitchen. I spend a lot of time and energy cooking and my current cookware is way overused and beat up. I have always loved both Rachael Ray and Paula Deen. So, I narrowed it down to one of their products. 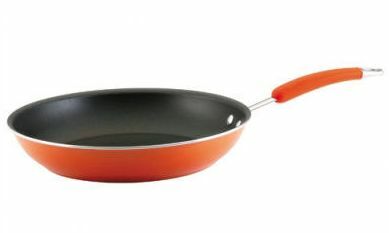 After browsing for awhile I picked the Rachael Ray Porcelain Enamel "Egg Buddy" Set in Orange. 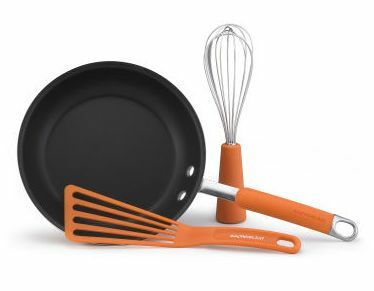 This set comes with a 9 inch skillet, a Spatula (called a Nylon Slotted Turner) and a Whisk. As you can see from the size of the skillet on my stove: it is huge! I do have one of those smaller sized stoves for small apartments, so it probably won't be this big on your stove top. Still, it is great when it comes to cooking hamburgers or chicken. I made hamburgers yesterday and it was so nice being able to flip them in this pan (yes, using my Rachael Ray Spatula) without them touching and falling apart. The hamburgers came out wonderfully. Another great feature to this skillet is that you can put it into the oven up to 400 degrees! I have not had the chance to try this yet, but I am super excited to. I will finally be able to make a Frittata, or maybe a quiche. The only thing that I wish I had now was a lid for my 12 inch skillet. It looks like Rachael Ray does not sell lids with her skillets. You have to buy a set, pot or saute pan. Luckily, I plan on purchasing a whole set in the future from CSN Stores. Overall my experience with CSN was exceptional. They went above and beyond on customer service by not only thanking me for noticing the problem, but by apologizing and fixing it. The products I received from them were all shipped at a decent speed. I was also provided with a tracking number to locate my items and know exactly when they would arrive. The items arrived well packaged. I highly recommend CSN whether you need something for yourself or a gift for a loved one. Disclaimer: I received the listed product(s) in exchange for this review. I was compensated in no other way. The views here are my own honest thoughts and opinions.